Chirnside’s Joelle Murray was in dreamland at the weekend after captaining Hibs Ladies to Scottish Cup glory. The Hibees replicated their male counterparts’ achievement by winning the Scottish Cup 6-5 on penalties as the match against Glasgow City finished 1-1 after extra-time. Lisa Robertson, who would miss the Capital side’s only spot-kick, had given her side a deserved lead with a well-placed header in the 23rd minute following a deep cross from full-back Claire Williamson. However, Hayley Lauder equalised for the league champions with a curling effort into the far corner midway through the second half. Hibs failed to capitalise on their superiority and, after Robertson had blasted the first penalty of the shoot-out over the bar, the trophy appeared to be heading to City. But goalkeeper Jenna Fife thwarted goalscorer Lauder – City’s fourth penalty – to give Chris Roberts’ side a reprieve and they grasped the opportunity as Samantha Kerr produced a carbon copy of Robertson’s penalty with a wild effort that sailed over the bar to hand Hibs a precious victory. 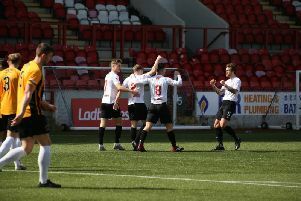 “I was there scribbling down some names hoping at least four or five were up for it but I then had to end up picking as I had ten players all wanting to take one,” said Roberts, who also guided his side to League Cup glory with a 2-1 win over City at Ainslie Park in June. “I had girls disappointed they weren’t in the first five to step up. So that was a great help to tell you the truth and Jenna’s save was huge as she got us out of a hole.